The cover art on this, like nearly all non-Collector’s Edition guides, mimics the cover art of the game. Cover quality is standard for BradyGames Signature Series guides, with heavy paper stock and a mixed glossy and matte finish. Rear cover is standard marketing messaging touting the features and content of the guide. The cover art so wonderfully captures the insane, over-the-top feel of Saints Row IV that I hardly see how it could be improved. 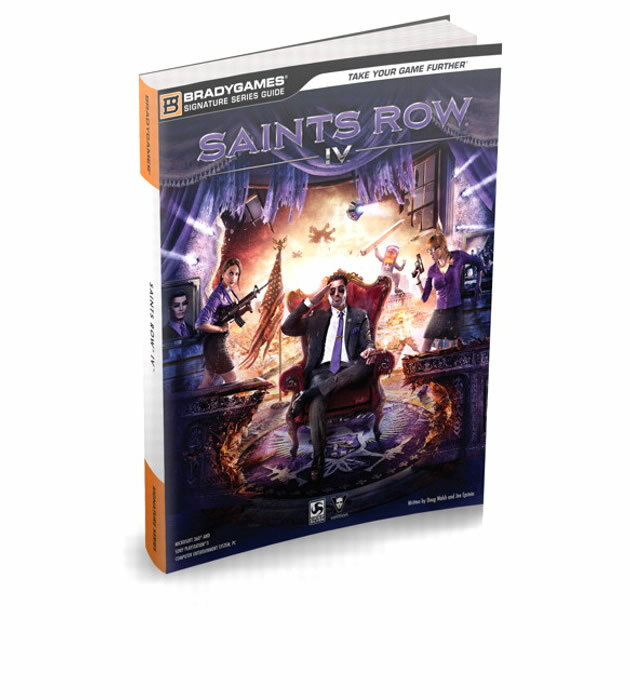 BradyGames maintains a consistent level of quality in their Signature Series guides, and that trend is continued with the Saints Row IV Signature Series Guide. Featuring a paperback binding, high quality matte paper, and a glossy front and back cover, this guide is built to withstand regular use throughout the duration of Saints Row IV, and considering the expansive nature of the game, that is a good thing. Through regular use over a week, there was no cracking along the spine or bends in the cover. 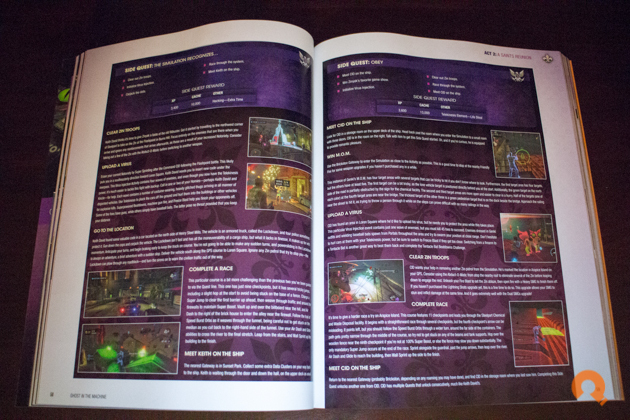 BradyGames’ designers are great at using the style and theme of the game, often integrating assets and fonts to the content of the guide. This definitely keeps your switching between screen and page more seamless to the eyes. Overall the design of the content and aesthetic context design is great, and really showcases the essence of Saints Row IV. One thing that deserves recognition is the sense of humor in the writing of this guide. There are numerous references and jokes that reflect the tongue-in-cheek humor of Saints Row IV and it really adds to the enjoyment of reading the flavor text throughout. BradyGames always likes to throw in a few value-adds with their guides. 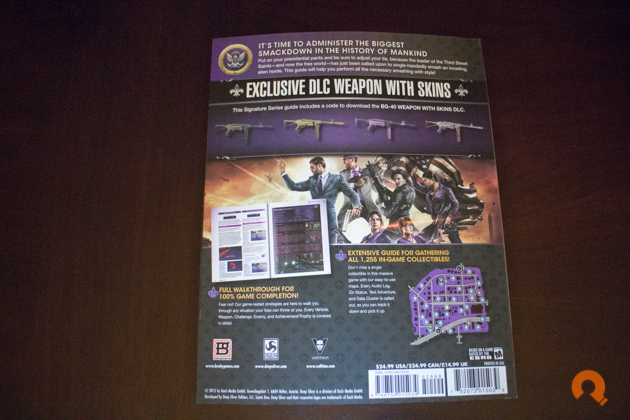 The Saints Row IV Signature Series Guide comes packed with a DLC code for the in-game BG-40 weapon with skins. 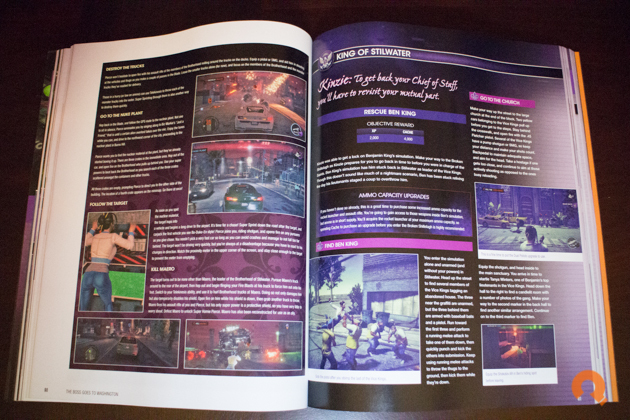 The guide itself features a comprehensive walkthrough, with sections outlining every weapon, vehicle, enemy, challenge, and a full achievement/trophy guide. All the collectibles are listed in the in-line walkthrough and also in a special section to help you find everything on your first time through. 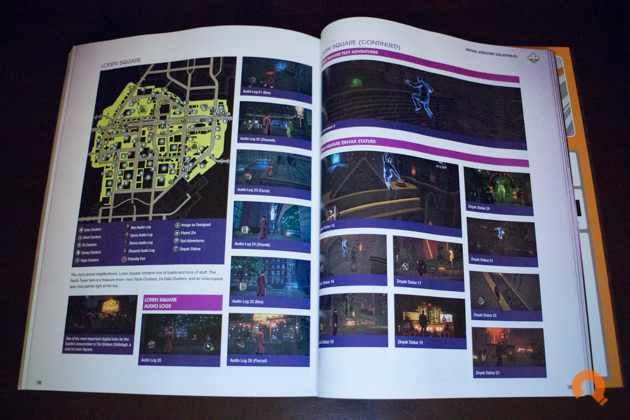 There is a comprehensive walkthrough of each act in Saints Row IV, with callouts to collectibles and secrets as you go. There’s also a full guide on personalizing your character, a backstory on how you rose to become the president, and a description of all the available upgrades. 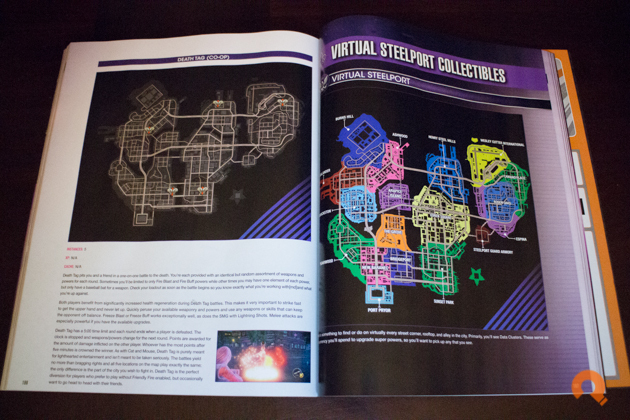 Once the story wraps up, there are maps, strategies, and guides for getting the best results on the challenge maps and courses in Steelport. Some of the tips and tricks are invaluable to short-cutting your way to gold, and will prevent countless hours of frustration and controller throwing. The collectibles guide is extremely useful for completionists, and leaves no secret undiscovered with clear maps and even a progression that helps find the items in order so you can find the ones you missed in story mode with ease. The guide, as with most from BradyGames, features a complete weapons and vehicle breakdown, and ‘beastiary’ showing all enemy types and details about their strengths and weaknesses. Wrapping up the content is an achievement/trophy guide which gives good descriptions for each achievement and info on how to easily attain each one. Everything in the Saints Row IV Signature Series Guide is what we have come to expect from BradyGames, but their high level of consistency and content depth have in a sense spoiled us as to what to expect. This book is packed with info, maps, secrets, and guides, but there is nothing in this case that makes it stand out from their other great Signature Series guides. 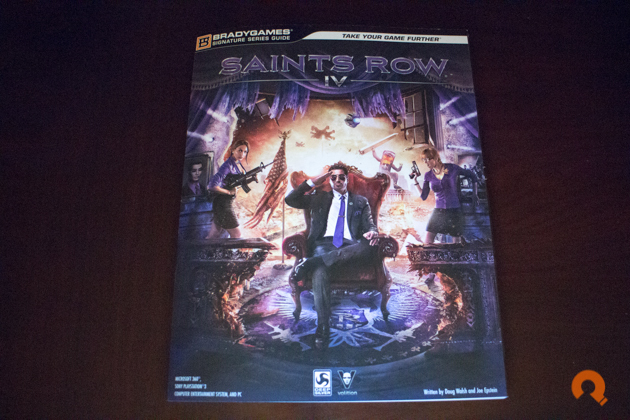 The guide covers Xbox 360, PS3, and PC versions of Saints Row IV, so regardless of your platform you’re covered. Signature Series guides retail for $24.99, but right now you can pick this up for around $15 on Amazon or BradyGames.com. 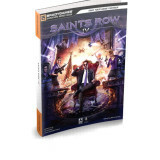 Considering the content of the guide and how unlikely it is that most people will find everything in the game without help, this guide is vital to your completion of Saints Row IV.